A grandson was arrested after repeatedly causing a fracas at his grandmother’s home. 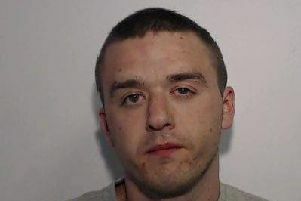 Danny Wise, a 30-year-old self-employed joiner, of Lowther Road, Fleetwood, pleaded guilty to breach of the peace. He was bound over in the sum of £100 for 12 months. Prosecutor, Carl Gaffney, said police had been called to disturbances at Wise’s grandmother’s home four times in 48 hours over the weekend. When officers arrived on April 7 they could hear raised voices and Wise was arrested. Wise told the court that was living at his grandmother’s address and he had argued with his mother, who was estranged from the family. A teenager kicked his best friend in the head only minutes after being warned about his behaviour by police. Thomson, 19, of Central Drive, Blackpool, pleaded guilty to assault. He was sentenced to eight weeks in a young offenders’ institution suspended for 12 months, ordered to do 40 hours unpaid work for the community and told to pay £115 victims’ surcharge. Prosecutor, Carl Gaffney, said CCTV operators monitoring the resort’s Salthouse Avenue on Saturday, saw Thomson and another man apparently fighting in the street. saw Thomson throw the other man to the ground and kick him in the head. The victim told police when they arrived that he did not want to make a formal complaint. Thomson had five previous convictions for violence against a person and at the time of the offence was on post sentence supervision from prison for an offence of assault. Patrick Nelligan, defending, said Thomson and the other man were best friends but had been drinking and got into an argument. A Blackpool mother was ordered to pay £500 court costs after she admitted failing to ensure her six-year-old son went to school. Casey Hurst was also made the subject of a 12-month conditional discharge. Hurst, 27, of Ashton Road told the hearing that she had medical problems herself which meant she could not keep tabs on her son’s attendance. Mike Caveney, prosecuting for Blackpool Council, said that the child’s attendance in class had slipped below the Government ‘s guidelines of 90 per cent. He said that the offence covered a period early last but the boy’s attendance had improved since he moved schools. A warrant has been issued for the arrest of a Blackpool mother. Lisa Sutton, 35, of Kentmere Drive, Mereside, was due to have been sentenced after being found guilty in her absence at an earlier hearing of knowingly failing to ensure her son’s attendance at Mereside Primary School.The court had written to Sutton telling her to attend her sentencing hearing but she failed to turn up once again and the warrant was issued. A chef was arrested after he got off a bus on a road he was banned from entering only weeks previously by a court. Nikki Aspinall, 26, formerly of Homestead Way, Fleetwood, who gave his current address as Shirehall Road, Sheffield, pleaded guilty to breaching a restraining order. He was sentenced to do 140 hours unpaid work for the community and ordered to pay £85 costs with £85 victims’ surcharge. Prosecutor, Carl Gaffney, said Aspinall had been put on an indefinite restraining order on January 29 this year. and sentenced to 24 weeks prison, suspended for two years after being convicted of two assaults on his former girlfriend and an offence of causing damage. The order prohibited him from contacting his ex and from entering Blackpool Road. On March 30 and April 5 Aspinall was seen getting off a bus which stopped on Blackpool Road opposite his former girlfriend’s workplace. Patrick Nelligan, defending, said his client had pleaded not guilty to assaulting his former girlfriend but been found guilty after a trial. Aspinall, who had pleaded guilty immediately to breaching the restraining order, had believed his ex was not working when he got off the bus twice on Blackpool Road.